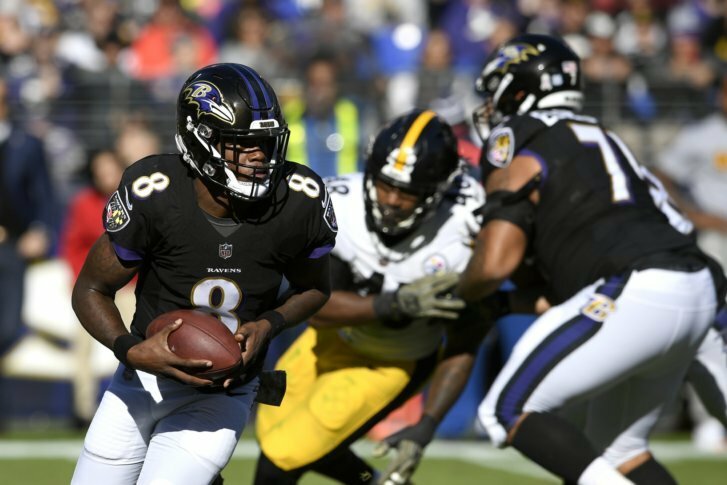 The Baltimore Ravens (4-5) scored only one touchdown in their third straight defeat, and the defense surrendered three total touchdowns to Ben Roethlisberger in a crucial 23-16 loss to the rival Pittsburgh Steelers. BALTIMORE (AP) — Going up against the NFL’s top-ranked defense, Ben Roethlisberger showed his versatility, grit and ability to bounce back from injury. That didn’t happen Sunday. Pittsburgh did not commit a turnover, and Roethlisberger went 28 for 47 for 270 yards. His 1-yard run made it 20-6 in the third quarter, and the 36-year-old showed his determination by missing only one play after being flattened during a sprint from the pocket with just over 13 minutes left. “Ben just got the wind knocked out of him,” coach Mike Tomlin said. The Ravens (4-5) scored only one touchdown in their third straight defeat, managing two field goals in the first half while falling behind 14-6. Baltimore had converted 72.4 percent of its red zone opportunities into TDs — the fourth-best percentage in the NFL — but on this day a 1-for-4 performance didn’t cut it. “To hold those guys to field goals in the first half when they were down there was significant,” Tomlin said. The defense followed by forcing the game’s first three-and-out, but the Baltimore offense failed to sustain the momentum. After the Ravens punted. Roethlisberger was collared from behind by Za’Darius Smith and remained on the ground for several minutes. Joshua Dobbs came in, completed a 22-yard pass to JuJu Smith-Schuster, then gave way to Roethlisberger. “That was a huge play,” Roethlisberger said of Dobbs’ first-down toss. Eric Weddle drifted back to catch the kick and took it back 18 yards, perhaps the only disappointing aspect of Big Ben’s day. The Ravens then settled for a field goal one play after Flacco failed to see wide-open Lamar Jackson on the right side near the end zone. Jackson, a rookie quarterback who’s been used in a variety of ways, went in motion on the play and was left uncovered. Ravens: Starting offensive tackles Ronnie Stanley (ankle) and James Hurst (back) were on the inactive list. … CB Tavon Young hurt his right ankle in the fourth quarter and did not return. Roethlisberger wore cleats emblazoned with a Star of David in response to the late-October shooting at Tree of Life Synagogue in Pittsburgh. The Star of David was in yellow and served as the upper part of the Steelers logo. There were also the words, “Stronger Than Hate” on each shoe. Roethlisberger and his wife are friends of Michele Rosenthal, a former team employee. Two of Rosenthal’s brothers were among the 11 killed in the attack.